Juneau is fortunate to house the talents of a diverse and active group of teaching artists! The Artist in Schools Program (AIS) provides many of these artists residencies (arts learning opportunities for students and teachers) in the visual and performing arts in the Juneau School District throughout the school year. The AIS program in Alaska is funded by the National Endowment for the Arts, the Alaska State Council on the Arts, and the Rasmuson Foundation. 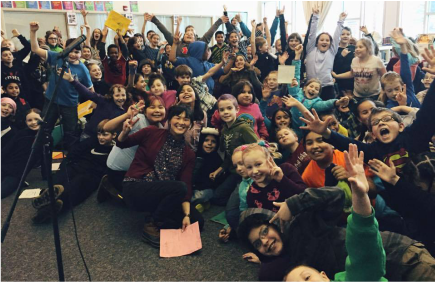 Teaching artist Christy NaMee Erickson hosts a poetry slam at Gastineau School. 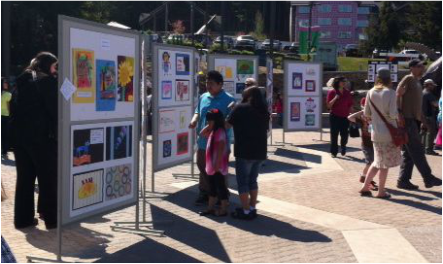 The JAHC assists with the Juneau School District Elementary School Juried Art Exhibit at UAS Community Day. Educate through the wonderful cultural opportunities that Juneau's very lively arts community offers. The Juneau Arts and Humanities Council serves as your link to most of the arts groups and activities in town.